Torsion springs are one of the most important components of your garage doors. At James Spring & Wire, we specialize in manufacturing single-bodied and double-bodied torsion springs with different end configurations including straight, offset, and hinge ends. As torsion springs are one of the most popular as well as custom ordered products that we manufacture, it is our goal to be able to produce them to meet the high standards of our client’s needs. For applications like garage doors, which are used multiple times per day and face extreme weather throughout the year, the operating environment, life expectancy, and spring load are taken into account when designing your custom springs. The strength and efficiency of torsion springs help to create an effortless movement of the opening and closing of the garage doors. That’s not to say that every component doesn’t have its working limit! A worn out or damaged torsion spring can cause problems in your garage door movement making it vital to regularly check the springs as well as repair or replace them when necessary. Why Should I Examination Garage Door Torsion Springs? In one word: tension. 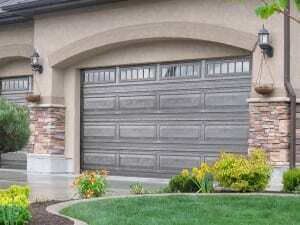 Garage door torsion springs wind up when the load of the door is applied and the spring reduces in diameter and body length during deflection. For these two reasons, the springs are under constant tension. Over the lifetime of the spring, the steel strength can wear off, causing the spring to crack or break. Sudden spring breakage can result in physical injury or damage to the door and the garage. Going the spring replacement route is always practical when your torsion springs are worn out. However, many people think that replacing just one spring is a one-and-done situation. If both springs are installed at the same time, that means they have the same service life and will most likely need to be replaced at the same time. Another reason to replace the secondary spring is because a combination of a new spring and an old one can result in inconsistent movement of the garage door. There is nothing more annoying than hearing the sound of the garage door squeaking as it is opened. Why does this happen? When springs are dry, the metal to metal contact creates a loud, sharp noise. Contact the James Spring and Wire to enquire about the best lubricant for effectively eliminating the chattering noise. Sometimes, due to inappropriate installations or simply because of extreme weather conditions, the springs can expand or contract, causing a change in the mechanical alterations. This can affect the tension on the spring and the overall movement of the garage door. In such situations, it is dangerous to try and make tweaks in the cable system yourself. Always call a professional torsion spring installer who can come in to make the appropriate adjustments to the springs as and the garage door.